Fine wine merchants expect the secondary market to rise this year if only by a small amount, with Burgundy, classic vintages of Bordeaux and Champagne leading the way. 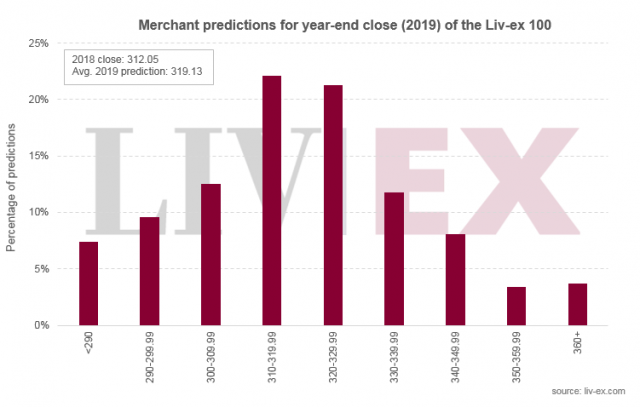 Liv-ex has released the results of its annual questionnaire given to its global members in which it asks whether they expect the market to grow or shrink in the coming year and by roughly how much. Last year merchants overestimated the growth of the Fine Wine 100 index which dipped 0.2% in 2018 after three years of gains. This year, 60% of respondents apparently expect the market to have gained to some extent by December, 34% think it will fall however and 6% expect it to run flat. The most optimistic respondent expects gain of 27% while the most pessimistic forecast a drop of 15%. On average, respondents expected gains of just 2.3%, with most plumping for a December close of 310-319.99 or 320-329.99. The FW100 closed at around 312 in December 2018. Many respondents expected Bordeaux to be among the weaker performing categories this year and as it makes up 68% of the FW100 this would in turn lead to a more muted market. Most (68% in fact) expected Burgundy to once again make the most gains and be the best performing sub-index on the Fine Wine 1000. Although the wider Bordeaux market wasn’t expected to make great gains the Bordeaux Legends index, featuring great mature vintages from around the Gironde was tipped to be the second best-performing sub-index and the Champagne 50 came in third place. These three indices were the best-performing on the FW1000 in 2018.